Unethical shutterbugs have joined the league of black magicians and pet rackets as a growing threat to the existence Slender Loris, a small primate found in parts of South India, says a new research note published in the Journal of Threatened Taxa. By surveying Kani tribes in Peppara wildlife sanctuary in Kerala and by analysing photos in a major Indian wildlife photography website, the study points out that unethical handling of Lorises for wildlife photography is rampant in South India. The practice could be one among the poorly documented threats to this smallest primate endemic to South India and Sri Lanka, says the study. Slender Loris is a nocturnal primate, found in two subspecies- (Loris lydekkerianus and Loris malabaricus) in South India which are active only in the night and spend their whole day sleeping round as a ball. The nocturnal nature of these slow loris keeps it elusive and less accessible to wildlife tourists and wildlife photographers alike. Arrange Loris photo-shoots, get paid! According to the study, wildlife photographers in Thiruvananthapuram - the capital city of Kerala- pay Rs. 500 to 1500 to the indigenous Kani tribes in the areas to capture Slender Lorises and arrange photo shoots. The practice occurs despite the fact that the animal is protected under Schedule I of The Indian Wildlife (Protection) Act, 1972. Apart from capturing and keeping it, the Lorises are often tightly held on short branches and prodded so that it won’t move during a photo shoot; to help the ‘professional wildlife photographer’ get enough good pictures. Moreover, the poor animal will be illuminated with torches aimed at it, says the study. It is a known fact that aiming strong light sources like torches and camera flashes at Slender Lorises for longer, will be irritating to the animal since it has very sensitive, large eyes to help their nocturnal life. The study team has also noted that the animal captured for such photo shoots are not returned to the place from it was collected. In one incident, to which the team was witness, the animal was released next day to an isolated bamboo clump near the house, after the photographer getting enough pictures. The bamboo clump had no vegetation continuity to reach back to the place from which the Loris was collected, says the study. As per accounts of the tribes, it is usual to get Loris with infants which are again treated the same way. Another respondent, says the study, has cut down at least four trees to restrict a Loris to a single tree so that it will not escape. The research team has also noted that the tribes are so much familiarized with the practice that they hold the animal in different ways to help the photographer get very good angles. It was while studying about the status of forest dwelling chelonians in Agasthyamalai region, that the research team came to notice the unethical wildlife photography practices.Arun Kanagavel, Rajkumar Sekar and Rajeev Raghavan of Conservation Research Group (CRG), St. Albert’s College, Cochin, and Cynthia Sinclair of Wildlife Information Liaison Development Society (WILD), Zoo Outreach Organization were part of the study team. However, from the study, it can be found that the tribes are not completely unaware of the conservation angle traditionally. Informal interviews with the kani tribes reveals that the tribes otherwise don’t prefer catching this insect eating, slowly moving primate, since it is believed to resemble their hill god (mala daivam). Connecting such organisms with the divine was an old, time-tested traditional trick of nature conservation in the Asian countries. The tribes also don’t keep Loris as pets since its looks are unpopular. They often consider it a bad luck to sight a Loris in the forests. Despite these beliefs, the money offered by photographers are luring the tribes to indulge in this unethical practices against their traditional beliefs. Actually, the tribes take extra pain to do the business. According to the accounts, painful bites are a usual while capturing the primate. When kept in home, the animal has to be covered under clothes to avoid women in the house seeing it, since unmarried woman having a look at the Loris will stay a spinster throughout the life, as per traditional belief. To study the trend deeply, the research team has also surveyed the Loris photos available on a major Indian wildlife photography portal. They have found that majority of the pictures were taken during day time, with the animal in awakened position, often hinting blatant ill-treatment. Out of the 28 cases they have studied, 16 involved mistreating the animal. 13 photographs of this nocturnal animal were taken during day. According to the study, the incidents of the unethical practice were more sighted in photographs taken from Karnataka. The ethical guidelines in wildlife photography discourage forcing an animal from its natural conditions to get favorable pictures. Altering the habitat of an animal to get beautiful pictures is anything beyond the ethical grounds of wildlife photography. However, it is unfortunate to notice that majority of the wildlife photographers – both professional and matures- are less concerned about such ethical aspects of the trade. “It is not this species alone that is facing threat. Instances of unethical photography inside the wildlife sanctuaries and core areas are growing,” said Balan Madhavan, wildlife photographer and a member of the International League of Conservation Photographers.According to him, Wildlife photography is part of nature conservation but these unethical practices by certain people are marring the very essence of it. "(Most of ) those people engaged in this unethical practice are doing it for popularity. They are less concerned about wildlife or its conservation and are uploading those photos on social networking sites", said he. It is time to bring some kind of regulation to such unethical practices, he added. However, the wildlife photographers are just an addition to the threats to the existence of this endemic primate. Earlier studies have revealed that astrologers in South India use it for picking tarot cards. Like the Slow Loris, pet trade target Slender Loris also. 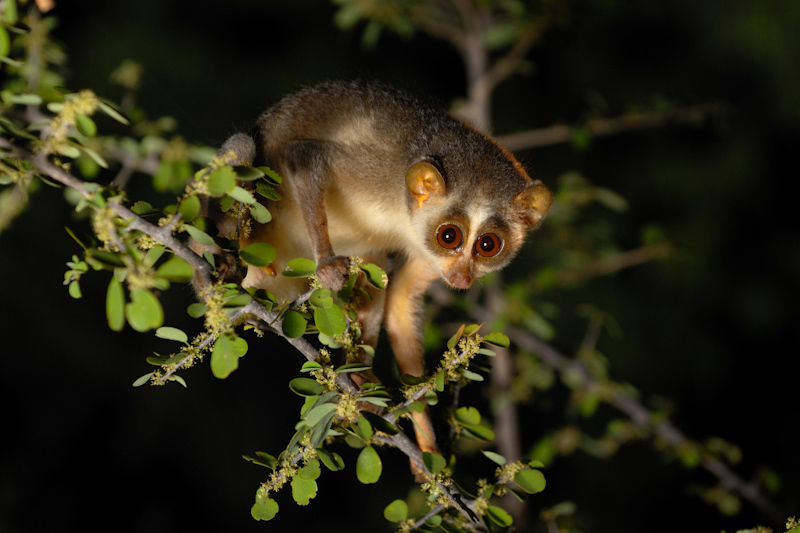 Practitioners of Traditional medicine also prefer loris since it is believed to have medicinal properties to treat a variety of ailments including leprosy . Some traditional medical practitioners also use the tears from Slender Loris to treat eye ailments and to prepare love potions. Illegal capturing and trading of lorises for all these purposes is a major threat to the life of this animal. Its such a beautiful animal. Such actions should be stopped immediately to save this endangered species. You are right Mr. Rathod. It is a pity that many of them who engage in such unethical practices are doing so to make money or to get some 'Like's in FB. So to keep such unethical morons down, everybody should decide that they will not buy, like or upvote any wildlife images which are unethically produced. Some people turn ruthless for silly reasons. We shall decide that such acts will not be encouraged. What a lovely creature and unique in its own ways. It is surely a delight to watch these creatures in action. The steps which you've mentioned should go a long way in helping these helpless creatures in their struggle for survival. More than that, awareness is the need of the day. I was not aware of this. This is so shocking ! Ashamed of such "photographers". We are happy that our post was able to spread the word. Hope you will try to discourage such unethical practices, wherever you find it in the future. I'm from Trivandrum and has always seen the forests where the Kani tribes live with awe. So ashamed to hear about such unethical practices just for some extra bucks and fame. We were also shocked to know that the practice has taken the form of some rackets. Hope you will also join the fight against such unethical practices. This is a very informative post, now that I think about the same, I see a lot of bird nest photos with chicks, i think that is equally unethical. Any wild animal being forced to pose or we forcing our entry in their world which can harm them and the babies should be banned and condemned.The magazine and websites should ask the photographer about the details how the picture was clicked in all such cases. Thanks for your comment and we completely agree with you . Though some intrusion into the habitat of an organism may happen while trying to get pictures, it is undoubtedly an unethical practice to manipulate the habitat of the animal(like cutting down the branches near the bird nest to get better pictures) or even capturing and mishandling them. The practice will come down if the magazines and websites keeping an extra eye on banning such unethically produced pictures, as you suggested. We should also make it sure that we will not encourage such pictures in social networks also. this is bad, such "wanna be" photographers should never be allowed to enter any wildlife protected area. What you said is true. It is high time to bring in some regulations on unethical photography. however, if it goes to the level of a carpet ban of photography in protected areas, we think it will adversely affect the conservation attempts too. The proliferation of cameras and photographers have also helped in reporting many rare organisms which in turn has helped in their conservation attempts. So instead of a carpet ban by the authorities, optimal regulations will be good. Above all, the best thing to do will be the photographers understand the cruelty done to these animals and abstain from such bad practices. horrifying! thats one word that screams in my mind when i read through this post. how can photographers who are supposed to showcase the beauty of nature to the public to help bring awareness and sympathy to these wonders, perform such acts!! a strict control on such people entering into jungles must be enforced. this would be extra load on the already struggling wildlife departments. It is really pathetic, I strictly want to keep these types of people out of the sanctuary.